Henan Tongren Aluminium Industry Co., Ltd.
Jul. 2018, New Slab Scalper for Profilglass S.p.A.
May 2018, One more Foil Mill contract! Apr. 2018, MINO awarded with the Contract for the supply of world’s largest Six-High Cold Mill for aluminium alloys! 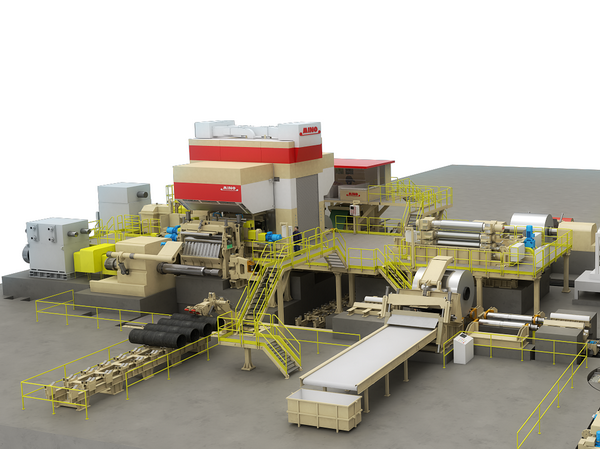 Feb. 2017, One more contract awarded to MINO for a new Cold Rolling Mill! MINO awarded with the Contract for the supply of world’s largest Six-High Cold Mill for aluminium alloys! MINO has been awarded by Henan Tongren Aluminium Industry Co., Ltd. with a Contract for the supply of a new Six High Cold Rolling Mill having a staggering 3000 mm barrel length! Such a wide mill, which will be the widest six high mill for aluminium ever installed in China and in the world, will be supplied by MINO for the new production plant of Henan Tongren Aluminium Co. in Sanmenxia. This new Mill will be able to produce more than 120.000 tons/year of strips of different aluminium alloys and shall be dedicated mainly for the rolling of strips for aeronautical applications. The Mill will be developed following the state-of-the-art design. It will be equipped with its own fully-automatic coil circulation system (which is interfaced with the High Bay of the workshop), coil preparation station, coil inspection station, automatic spool transfer device, automatic strapping and marking, advanced AGC/AFC controls developed by MINO and powerful medium voltage AC main drives. The Mill stand will be provided with the latest technology of induction type hot edge system for work rolls and with long stroke shifting system for the intermediate rolls: such devices allow the Mill to cope with different values of strip thickness and of strip width and to roll in stable conditions and with proper control of the strip flatness and strip edges, up to the maximum speed of 1200 m/min. Being the maximum entry thickness 12 mm and the maximum strip width 2850 mm, some key data of the Mill are just extraordinary for a cold mill, such as the weight of each mill housing that will be 170 tons and the maximum rolling force that will as high as 3200 t! The whole L1 Automation, the Technological Control System, the mathematical models of the Rolling Recipes and the whole L2 will be developed by MINO’s Automation Division. The mill will be connected to the L3 of the workshop and will be able to automatically exchange all the necessary information about the rolled coils and the relevant technological parameters with the other systems connected to the L3. Max. rolling speed 1200 m/min.